This is my first quick take Friday. I've been reading them for months and never posted one before. It's like wanting to wear the same clothes as the cool kids and being fairly certain they'll know I've copied them. However, Kendra was super welcoming and convinced me I am one of the cool kids. 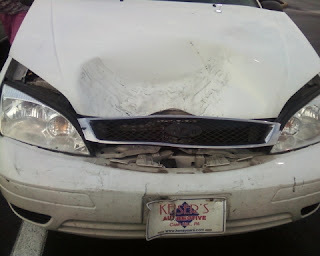 I got in a car accident the other day... Not just the other day, my husband's birthday. This stinks on several levels. Not only was his birthday ruined, but so was the front end of my car. There seems to be an insurance issue and they don't plan on covering any of my damages. P.S. I still owe $7000 on the car. I love Delta SkyMiles and Hertz. I was able to find a super low costing rental car for this weekend. We had planned to go visit Dustin's sister this weekend. He shares a birthday with his nephew. I was super bummed when my car went crunch and thought we might not be able to go for the trip. Not only did I find a car for 20.00 a day, but I earn 100 Delta SkyMiles. Wanting ice cream and needing ice cream are completely different things. I love ice cream and being pregnant makes it oh so much worse. And by worse, I mean, YUMMY ICE CREAM IN MY FREEZER! It is now officially Sunday night, but I'm still going to post this and pretend I got it done Friday. Everyone just go along with it. I got a Chocolate Mousse Cake to take to Virginia this weekend for Dustin and Riley's birthday. If you ever find yourself in the small town of New Cumberland, PA do yourself a favor and stop at Dingledein's Bakery. Funny name, AMAZING baked goods. I'm trying to blog more frequently. I'd really like this to be more of a regular gig than a hobby. I'm looking for some themes to keep me on a schedule. If you have a suggestion please comment.